*Doctor checks my cervix for progress next week!! I'm already really antsy/excited about it! *Cravings? Cold and fresh, anything. It's like a repeat of my exact cravings from the 1st trimester! I can't get enough of: smoothies, fruit (craving oranges big time lately-some days I eat 3 of the little cuties! ), chocolate covered frozen bananas, yogurt, etc. *He has been getting the hiccups almost everyday for the past couple weeks! Billy felt them the other day, too. *Overall, I still feel pretty comfortable (except getting in and out bed-woof!) but I'm definitely OVER wearing maternity clothes. Over. them. completely. *Officially "on a break" with the gym! I put my membership on hold, but am still planning on going for walks here and there and doing some small exercises at home. *Enjoying: Driving around with a car seat in the back of my car (it's installed and ready to go! ), sleeping in while we still can, and that I'm still feeling good! Thankful for that! *Disliking: My entire wardrobe....itching to wear my normal pants and tops again! +Baby booties. This personalized name blanket. MUST HAVES!! +I'm resting and relaxing a lot more lately. Billy has been such a big help, too. Actually this entire pregnancy he has been amazing and I haven't given him enough credit! 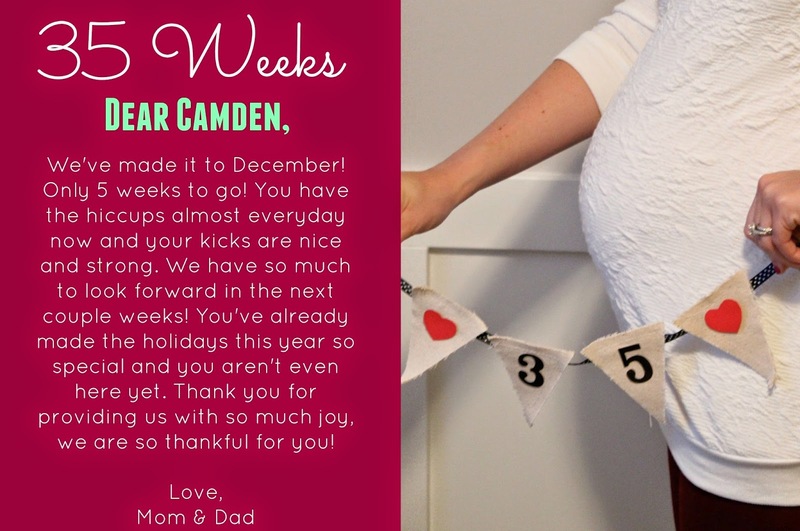 +I've started asking family and friends to make guesses on what day they think Camden will make his arrival, so I can see who (if anyone) will be right!! I'm weird like that and like to hear people's guesses! Soooo...it looks like most people think I will go into labor a week early. I'm really surprised no one has guessed a December baby!?! And in this case, I hope everyone is right and he holds off until Jan! *Looking forward to: The BIG doctor's appointment next week and having a little boy to love on, and call our own, soon!! Now can I ask for your help mama's? If you have any recommendations on what to pack in our hospital bags (or what NOT to pack), leave it below in the comments! You're almost there! Enjoy these last few weeks just you and Billy! Where is the sweatshirt in your gym pic from? 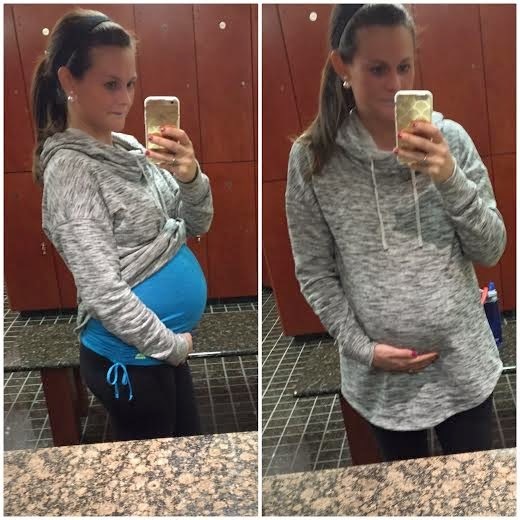 I'm 20 weeks and need a little more loungewear and stuff to wear to the gym. Also, what maternity tops are you working out in? Also, I didn't really buy any maternity tops. The one I'm wearing is from TJ maxx and I bought most of them from there but just sized up on them. I am completely with you and totally over maternity clothes!!! So ready to move my regular wardrobe back into my closet!! As for the hospital bag I recommend making sure you pack both long sleeve and short sleeve shirts for your husband (your body temp will change a lot throughout your stay and our poor husbands have to sit through it all! ) You also really don't need very much for the baby..going home outfit and maybe one other outfit. The hospital provides so much! Oh, I also remember thinking I won't bring the bobby this time around either, the hospital has so many pillows to help with nursing! Pinterest has great lists, so I'm sure those will help you out too!! Hope that helps!!! You are getting so close!!! Enjoy the last few weeks! Ahhh, yes! Me too! Those are great suggestions, too. Thank you girl! Oh how fun. The last few weeks are so anxious as you wait for your first little one to make their debut. As far as hospital bags - the first time I went into labor a month or so early and brought basically nothing with me - do not recommend that the second time I brought WAY too much stuff. A going home outfit for you and baby - cords for your phone, camera and tablet (if you bring one), snacks! bottled water and lots of it (my hospital served tap water, yuck), undies that are comfy adn you dont care if you ruin and comfy pants, nursing tanks and t-shirts, our hospital supplied everything for baby and even toiletries for me so I didnt end up using anything i brought except the going home outfits and our phone and camera (alot). Oh and your boppy pillow and car seat (my hospital inspected the baby IN the car seat before they let us leave. Take your Boppy/u-shaped pillow. This made all the difference in nursing for me. Blessings! After many people saying the same, I think I will! Thank you Jessica! I gave you my recs for the hospital bag :) I'm going to guess NYE baby! I hope he's the first one born in 2015, then you get all kinds of free stuff... wouldn't that be fun? :) You're so close and you look great!! thank you Michelle! Off to read it! You look so great, girl! Cannot believe how close "we" are to meeting lil Cam!!! The hospital pretty much provided everything that you really need. The only think that I chose was my own pads the hospital pads are a little annoying. You only need one outfit for baby to come home in and besides that definitely a cell phone charger and maybe some hard candy. Hi Cindy! Thanks for the suggestions! I'm an over packer by nature so I hope I can keep my list down, haha! I was glad I brought an extra outfit for Lucy b/c I didn't realize there'd be a hospital photographer to take her pictures. I second what everyone said about taking as much home from the hospital that you can. Every time they'd wheel Lucy in her cart to the nursery, they'd restock the diapers so when they brought her back, we'd put them in our bag and then they'd restock again ;) I wore yoga pants, a nursing tank, and a zip up hoodie both days I was there and was very comfortable. They will give you tons of pads too and even these frozen ones which are amazing after a vaginal delivery (probably TMI but it's true!) Don't bother bringing books or magazines b/c that's the last thing you'll be doing. Once your sweet boy is here, you'll just stare at him for hours on end :) One more thing we brought was a bag of Cheryl's a Cookies for the nurses to say thank you. We put them at thr nurses station by my L&D room and I swear we had better care b/c nurses kept stopping by to check in & say thanks even though they weren't assigned to us ;) And make sure you eat & drink, if you can, before going to the hospital b/c once you're admitted you can't even have water (only ice chips & Popsicles) and I was dying for a glass of water!